Representative Honours: Northern Ireland: 2 B Caps (1995-1997). Club Honours: (with Linfield) Irish League Champion 1992/93, 1993/94; Irish Cup Winner 1993/94, 1994/95; Irish League Cup Winner 1993/94; Floodlit Cup Winner 1993/94; Co. Antrim Shield Winner 1997/95; (with Coleraine) Ulster Cup Winner 1996/97. A late developer in the game, Ballymena-labourer Wes Lamont played junior football in his hometown until, as a 26 year-old, he was signed by Linfield. 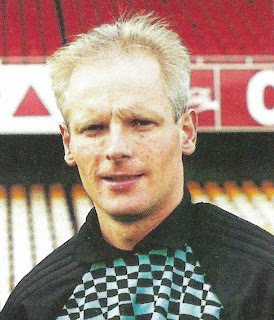 A highly consistent goalkeeper, good in both the air and on the ground, he gained rapid elevation to the Blues' first eleven and in six seasons at Windsor Park he earned every honour in the local game with the exception of the Gold Cup and Ulster Cup (he missed the 1992 final due to injury, with on loan Stoke City-veteran, Peter Fox taking his place). In September 1994 Lamont, by then 30, was called into the Northern Ireland squad for the first time, taking his place on the bench for a Euro '96 qualifier against Portugal at Windsor Park as back-up to Alan Fettis. A month later, with both Fettis and Tommy Wright unavailable, he was again called into the squad, but it was Ards' Paul Kee that was preferred for the matches with Austria and the Republic of Ireland. Lamont was rewarded by Bryan Hamilton with a B cap the following February, coming on as a substitute against Scotland. In 1996 Lamont left Linfield for Coleraine. His form for the Bannsiders, who put in a concerted challenge for the 1997 Irish League title, again placed him in the thoughts of Bryan Hamilton. In February 1997 Lamont kept a clean sheet for Northern Ireland B against Portugal Under-21s and come the following August, with Fettis and Wright again unavailable, it was expected that he would be included in the squad to face Germany at Windsor Park. It was not to be however, as Aiden Davison and Roy Carroll where the 'keepers included in the squad. In 2000 Lamont joined Crusaders, but his career at Seaview was brought to a close following the arrival of none-other than Paul Kee in 2001. He later joined the coaching staff at Ballymena and re-registered as a player in January 2014 when the club was suffering an injury crisis. Summary: 1(1)/0. Won 1, Drew 0, Lost 1.